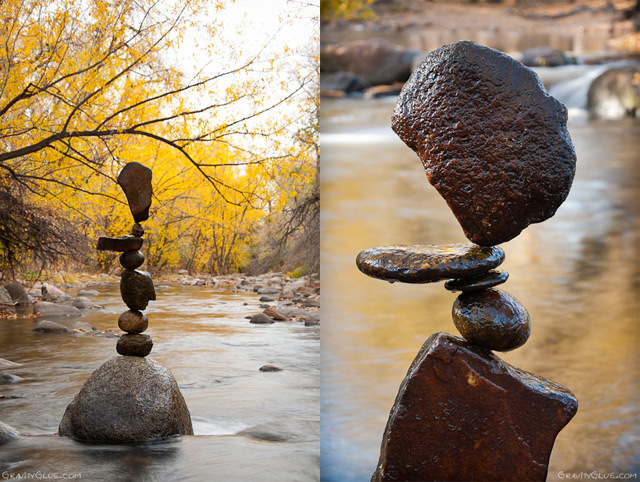 Land artist Michael Grab creates astonishing towers and orbs of balanced rocks using little more than patience and an astonishing sense of balance. Grab says the art of stone balancing has been practiced by various cultures around the world for centuries and that he personally finds the process of balancing to be therapeutic and meditative. Over the past few years of practicing rock balance, simple curiosity has evolved into therapeutic ritual, ultimately nurturing meditative presence, mental well-being, and artistry of design. Alongside the art, setting rocks into balance has also become a way of showing appreciation, offering thanksgiving, and inducing meditation. Through manipulation of gravitational threads, the ancient stones become a poetic dance of form and energy, birth and death, perfection and imperfection. Almost all of the works you see here were completed this fall in locations around Boulder, Colorado. You can see much more in his portfolio as well as several videos of him working over on YouTube.